I haven’t posted in a few days (if anyone noticed haha). Before I explain, I’ll link to this recent post regarding a wild Cockatoos on Laura Rittenhouse’s Gardening Journal. Take a look; I had no idea flocks of Cockatoos fly around down there sort of like our crows do here. OK, so after reading her post you might have figured out where this is going. Certainly the season’s default weather continuation (generally wet, gloomy and overcast conditions) contributed, but my primary reason is explained/admitted below. Back on the holiday (July 4th) I began setting up what was to be an incredible post (by the lax standards of Behind cohutt’s fence) showing a beautiful Green Darner dragonfly emerging from the nymph stage (perhaps the original one of the few technically correct uses of the term “metamorphosis”), leaving behind the exuvia, and pumping itself up/hardening off into a full fledged dragonfly “adult”. 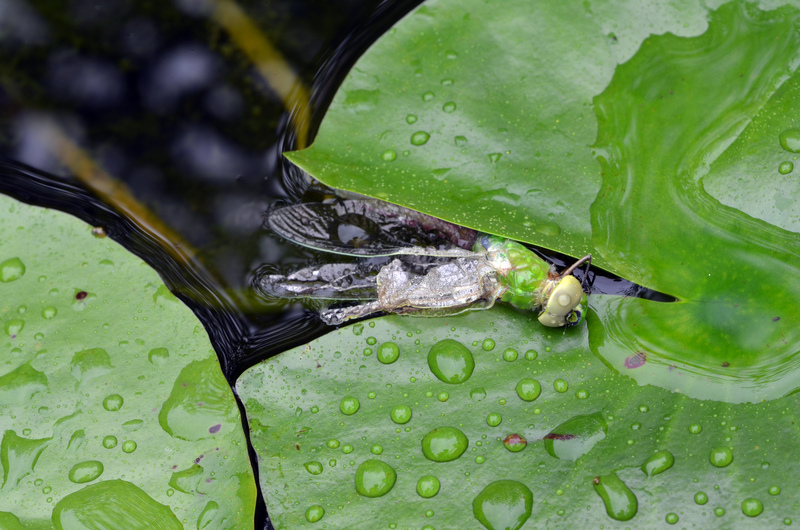 Nearby, like a castaway who has just pulled himself ashore from a shipwreck, one of the emerged dragonflies was halfway out of the water, seemingly resting on the edge of a partially submerged lily pad. I noted that it was in a particularly vulnerable spot, served up very close to the edge of the pond as birds began their morning activities. Rather than trying to move this one in its still soft state, I suspended some plastic fencing over that part of the pond to deter birds from snatching it up. In the 5 minutes or so I was hovering over this fella inspecting the situation and taking these pictures, I was fairly certain I could see some movement. 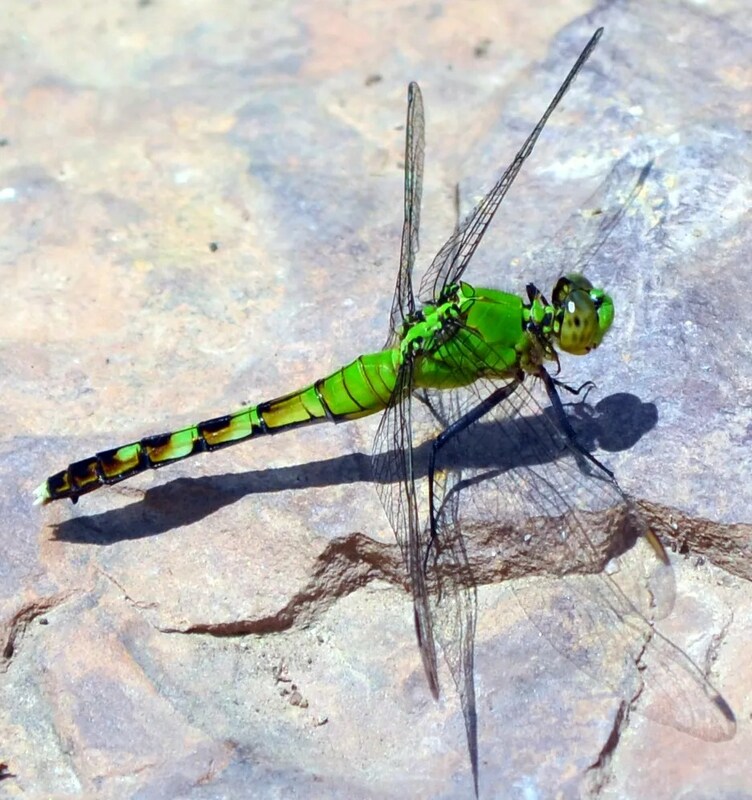 Last year a similar situation occurred and the waxy-winged dragonfly pulled itself out of the water onto a rock and finished the transition process; so I assumed all was well and set up the bird-guard and went back inside to research. Inside, I learned from Dr. Google that it takes about 1 hour for a newly emerged adult to transition into a fully functional flying predator. 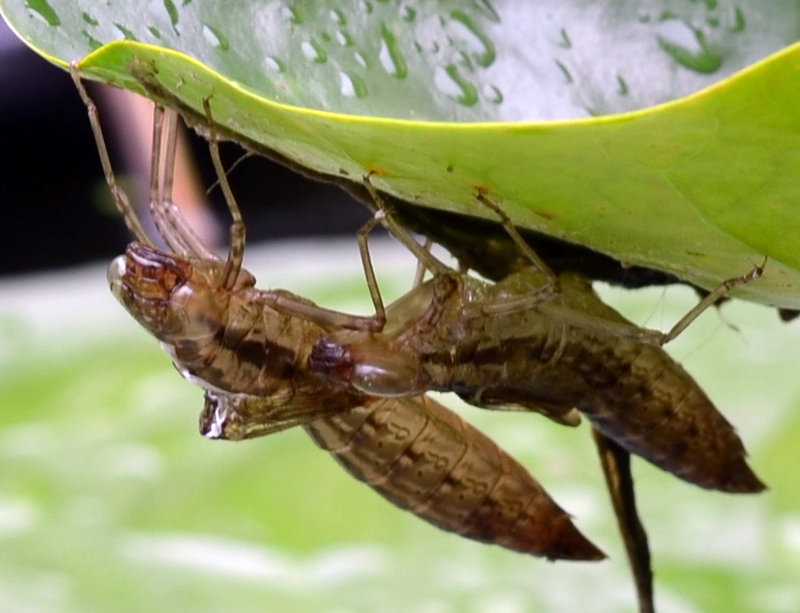 Typically they remain on whatever object the exuvia is anchored to while finishing the metamorphosis. 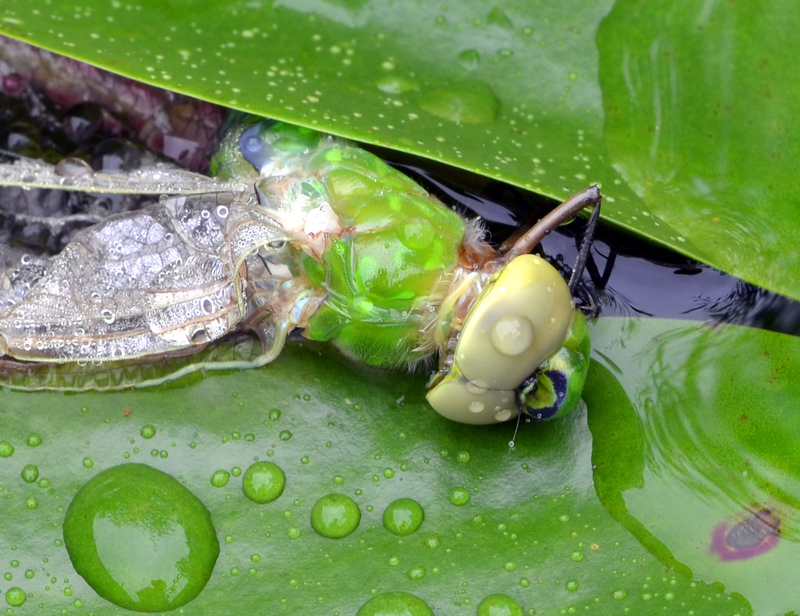 Amazingly, they simply gulp air steadily for an hour or so, which expands them in the correct directions/dimensions until they have that classic adult dragonfly body. In short, they pump themselves up and quickly fly away to eat and avoid predators. Hmmm… One hour, gulping air, inflating/expanding….. I realized something was wrong and went back out 30 or 40 minutes later to find that nothing had changed; he/she was still lying in the same spot on the same position. Perhaps the storm knocked it off into the water as it was emerging; who knows, but something definitely went wrong at the wrong time for this guy. This really bummed me out more than it should have; I felt responsible for the habitat that attracted them & ultimately did one (or more) in. Yes, it is silly but it is hard not to project too much into the creatures that live and around in my garden. I guess I’ve gone “bug crazy” or something. In closing, I’ll just say I’m glad we don’t have flocks of old cockatoos flying around north Georgia. You are bug crazy, but there are worse character flaws! That last photo is very sad. I know gazillions of beautiful insects die every nanosecond, but seeing it is still moving. As for cockatoos, they are beautiful (noisy, destructive) creatures – but, yes, I hope not to witness the loss of many more of the old ones. Yeah, we have to move on, and experiencing life beats not…. If it brightens your day a bit, I have late nesting baby bluebirds in my rock city birdhouse. That is sad! I had to kill a palmetto bug a couple of nights ago. Really can’t stand them, but it looked so pitiful once it had been despatched. . . .
I’m less sympathetic to those although I admit to have escorted to the back door on more than one occasion. 😦 I have an agreement with all the spiders & “outside” bugs…. they can live anywhere on my 10 acres they want but NOT in my house. I’ve had to work around quite a few spiders (me no likey) to honor that agreement but we do pretty well. I have a soft spot for the magical little dragonflies. They never seem to stick around too long around here. I ought to blog a bit & post a few pics now & again. You inspire me. I can’t really keep up with the garden & house as it is though. My son is getting married in my yard this year & I’ve got some catching up to do. Thanks for your lovely posts. I’ve been super busy & out of town a lot so haven’t even kept up on my internet “stuff” lately. Keep up the great work though. Thanks Genene, you always have kind and flattering comments. One more Bug Note: I’ve become a fan of the House Centipede (Scutigera coleoptrata). I used to try to kill them when I’d see one in my NYC apartment — until I read this: “House centipedes feed on spiders, bed bugs, termites, cockroaches, silverfish, ants, and other household arthropods” — the perfect household guardians, in other words! And they live from 3 to 7 years! veritable Methusalehs of the insect world.